Alicia Vikander is reportedly signing on for the upcoming Tomb Raider 2. MGM and Warner Bros. have hired Amy Jump to write the sequel and Vikander allegedly likes what she has seen from Jump's work thus far. Jump previously "adapted High-Rise for actor Tom Hiddleston and co-wrote Free Fire with Ben Wheatley." It's unclear how the sequel will move forward at this point, but we should find out soon since it's currently being planned out by the studio. While the plot of Tomb Raider 2 is under wraps, the first installment took a lot from the prequel video game series, so it is believed the sequel will draw from the same source material. Geneva Robertson-Dworet and Alastair Siddons wrote the first movie from a story by Evan Daugherty and Robertson-Dworet, which was able to earn $274.7 million globally, turning Alicia Vikander into a high-profile action star. 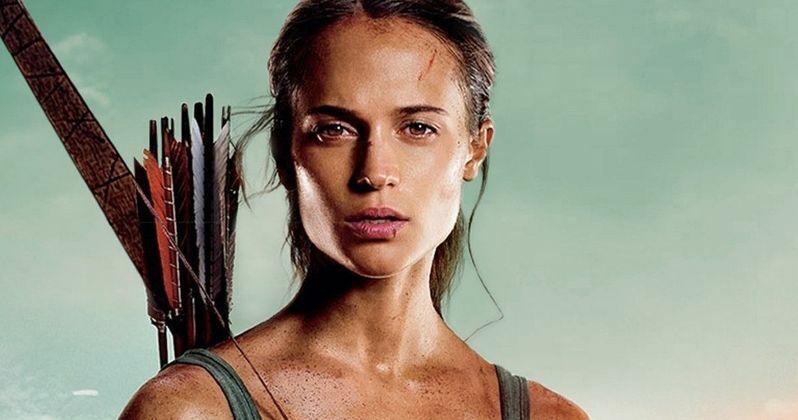 Roar Uthaug directed Tomb Raider, but isn't clear if he will be returning to helm the sequel since the studio has decided to with a new writer, which should bring in a new tone. Tomb Raider received mixed reviews from critics at the time of its release last year, with Alicia Vikander's performance as Lara Croft proving to be divisive. Some fans of the franchise were impressed with what she brought to the role and for the fact she was able to take over a role that Angelina Jolie originally made famous. However, there were others who thought her performance fell flat and was not as good as the previous installments. Whatever the case may be, the movie was a solid earner at the box office.